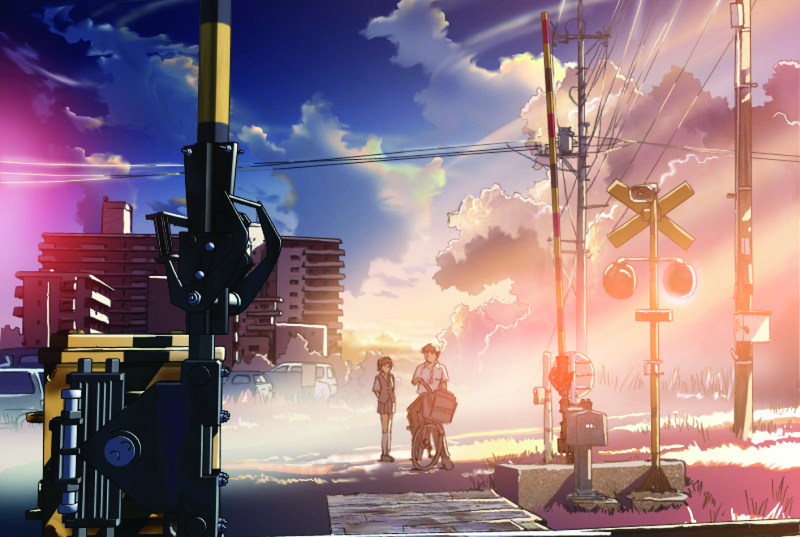 Makoto Shinkai, a 42-year old anime director has built a notable career as a central figure of the Japanese post-Ghibli generation of animation directors. The difference is that Shinkai is labeled with any studio name, but has built his name by working alternatively alone, later with with a few other colleagues, mostly composer Tenmon. His favorite anime is Castle in the Sky by Hayao Miyazaki, and many reviewers have noted on Miyazaki-type of elements in Shinkai’s work. Here such a thing would be the interesting airplane the protagonists build in order to reach the mysterious Ezo Tower. Another well-known reference to previous masters is the poem on of the protagonists reads in the beginning, by Kenji Miyazawa – better known to most readers here for the appearance of his work in Giovanni’s Island. Alternative Japanese post-war history has been the setting of several anime films including Jin-Roh. Here in A Place Promised in Our Early Days the setting is formed with reference to WWII, since the ending of which Japan has been divided into two parts, with the main island Honshu and other southern-parts belonging to the U.S. zone and the northern-most island Hokkaido, here called Ezo being part of the never quite spelled out coalition called the Union, perhaps referring to the Soviet bloc. It is late 1990s and the three main protagonists, two young men Hiroki and Takuya and girl Sayuri live their high school days in Aomori, the most northern part of the U.S. zone of Japan. Over the Tsugaru Strait they can see Ezo and the mysterious tower rising up to the sky. The tower has been there since 1974 for a mysterious purpose not known on this side of the divide. For the three youngsters this tower symbolizes something unreachable, a dream, a future possibility, and they make a promise to go there some day. Soon Sayuri, however, develops narcolepsy and is taken to Tokyo for hospital treatment. Three years pass and the two parts are on the brink of war. Hiroki is now in Tokyo, working for the U.S. Coalition government for a research project on parallel worlds that are somehow linked to the Ezo tower. He finds out that Sayuri is in coma and contacts Takuya for help. Somehow Sayuri’s problems are also linked to the Ezo tower and Takuya and Hiroki start planning a way to save Sayuri, which would involve rebuilding a crashed airplane called Bella Cielo (the Italian name being another reference to Ghibli). Takuya has gotten involved with the underground Uilta Liberation Army, and is promised a trip to Ezo with the group. Nostalgia for teenage days, a constant theme in Japanese anime and live films gets a beautiful realization in Makoto Shinkai’s hands. The anime actually features a double nostalgia: for Hiroki, Takuya and Sayuri to their schooldays of the beginning part of the film and for the viewer for the beautiful young idealism, the promise to be kept, and the deep friendship and youthful first love amongst the protagonists. These themes get a wonderful visual realization with the depiction of Aomori scenery, during the happy school days bathing in a beautiful evening light, and the later ones getting a more sinister threatening tone with the possibility of another war. The end song “Kimi no Koe” by Ai Kawashima wraps up the emotional nuances of the story. Eija Niskanen is the programming director for Helsinki Cine Aasia-festival. The Place Promised in Our Early Days is released on Blu-ray and DVD by Anime Ltd.